Meat isn’t the only thing that belongs on the grill. When grilling, vegetables are always my go to. They are quick, easy, and DELICIOUS! The best part about grilling vegetables is that the possibilities with them are endless! You can prep them with various marinades, cut them in multiple styles, and throw them on/in almost anything. Today I am going to give you insight on how to spice up your plain old quesadilla, into a delectable flavor-blasted vegetable quesadilla! Your favorite vegetables—Mine would be zucchini, onions, and mushrooms. If you don’t like mushrooms, you have got to try them grilled! Grilled mushrooms are probably one of my favorite things grilled of all time. I put them on pizza, kabobs, quesadillas, sandwiches, and flatbreads... I think you get the idea, but I highly recommend giving them a second chance if you wouldn’t consider yourself a mushroom fanatic prior to this meal. Occasionally I also like to add a few peppers for flavor and color (your food has got to look good too!!). Cheese- when grilling quesadillas I prefer cheddar or mozzarella. I like the way it tastes melted with the vegetables. Tortillas- any type of tortilla works well when making a quesadilla. I prefer flour, but corn works too! Veggie Basket Accessory- Before combining the vegetables with the cheese and tortillas, you are going to want to sauté them in the veggie basket! I love the veggie basket! It simplifies the process of sautéing the veggies and you can use it for almost anything—shrimp, fruit, you even can use it for indirect grilling on the Q1200! Oil & Seasoning- I always like to add a little bit of oil and salt/pepper when I am sautéing my vegetables. Gives the veggies more flavor. 1. First thing’s first! You’ve got to PREHEAT your grill on high for 10-15 minutes. After your grill is preheated, brush the grates with a stainless steel brush. Turn down the heat to medium direct (350-450F). 2. 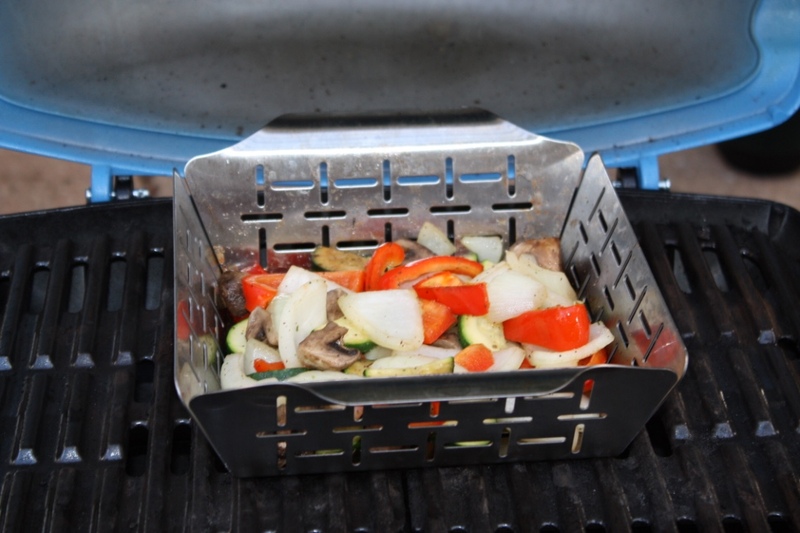 Put your veggies in the grill basket and grill for about 3 minutes. 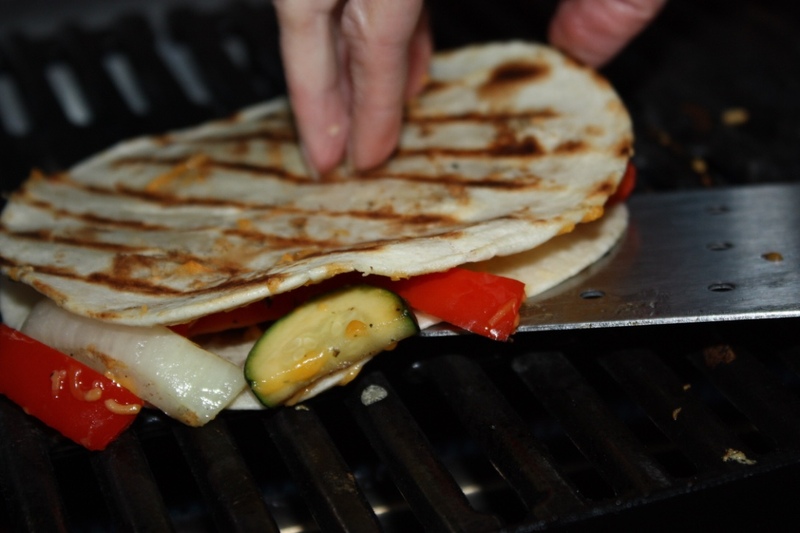 After three minutes are up, it is time to put your tortilla and cheese onto the grill! 3. Now is the time where we are going to take our veggies and add them to the cheese/tortilla combo. In order to do this we are going to use a plate to lay the bottom half of the quesadilla on. Sprinkle it with the cheese of your choice then add in the veggies! Use a grill mitt to take the basket accessory off of the grill to add to make the tortilla and cheese duo into a trio. A tip I find helpful when placing the quesadilla onto the grill is lifting the lid of the grill and then bringing the plate you have the quesadilla on close enough to the grate so you can tilt the plate to help guide the quesadilla onto the grate with the help of your spatula so you can nicely place the quesadilla on the grill without losing elements of your meal. 4. Grill for 2 minutes on each side. If the cheese is not melted you can leave the quesadilla on for another minute on low indirect heat. 5. Then use your spatula to remove the quesadilla from the grill and put on a plate to cool for about 2 minutes. 6. 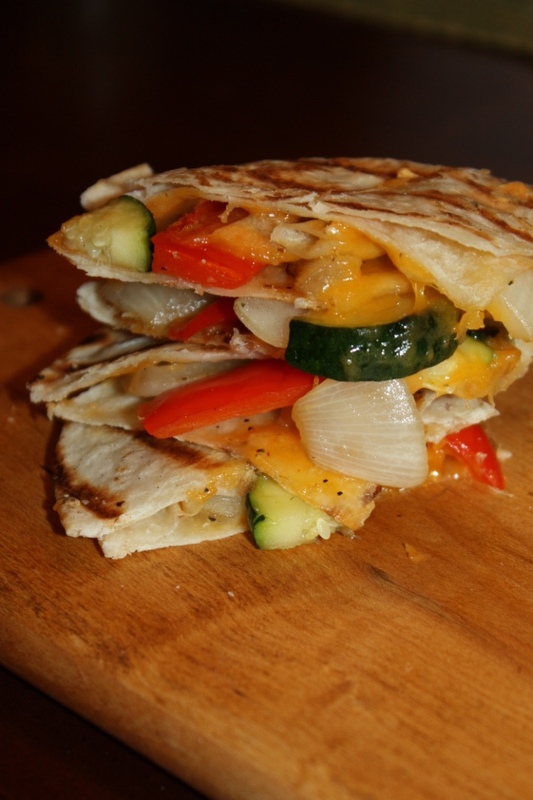 Once cooled, slice your quesadilla into halves, 1/4s, or leave it as a whole. Enjoy!